I never did play the first BIT.TRIP RUNNER, and I didn’t know much about BIT.TRIP Presents… Runner2: Future Legend of Rhythm Alien before I actually started playing it. I assumed there would be running, and I was not disappointed! 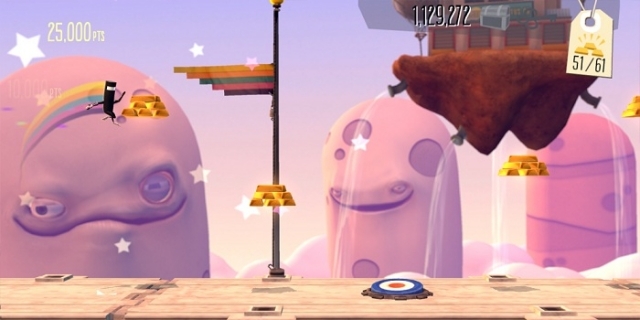 Runner2, as is turns out, is a side-scrolling platformer with heavy rhythm components. You play as the ever-running CommanderVideo. He just can’t stop running; he loves it so much. Your job is to navigate him through the various obstacles in each of the 100+ courses until you make it to the goal. Getting hit even once will knock you back to the start of the level, or to a checkpoint if you’ve reached one, so you’ll have to do everything perfectly to beat a level. That’s the game in a nutshell. The second I started playing the game, I could tell it was full of personality. 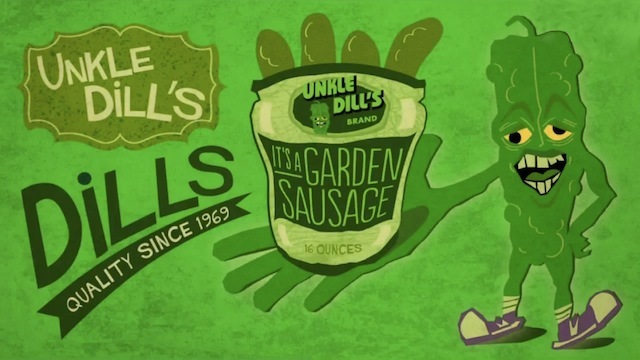 I was greeted with the announcer’s voice informing me, “Today’s thrilling episode is brought to you in part by Unkle Dill’s Dills—a garden sausage!,” along with an ad for said “product.” I had never heard pickles called garden sausages before, and it cracked me up! Thankfully, after that, I got a synopsis of the first game (or at least the end of it) and the setup of the second game. CommanderVideo and his friends are chasing the evil Timpletot through the hypersphere when he gets hit by a reality unfusion beam and is sent to an unknown dimension. He spends the entirety of Runner2 trying to return to his own dimension. That’s basically the entire story; there’s no dialogue, either, just the narrator. The ending is pretty hilarious, but you’ll have to play the game to see why, ’cause I’m not going to spoil it. Runner2 is very clearly not a story-intensive game, but it still has a wacky cast of playable characters you can unlock, each complete with unlockable alternate costumes. My favorite character was probably the reverse merman. I had to stop playing with him because I couldn’t stop laughing at his dance moves! Even the loading screens are fun. The top-right corner will display a tip or message. My favorite messages were “Put your mouth around a Burger Mouth Burger Brand Mouth Burger,” “Make sure to eat a banana every day!,” and “Gaijin Games loves you.” Aww, thanks, Gaijin Games. I’ve grown rather fond of you, too! 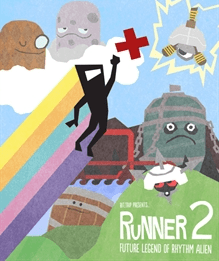 Much like old Mario games, BIT.TRIP Presents… Runner2: Future Legend of Rhythm Alien is divided into different worlds, each comprising many levels. There are 100 levels, and hidden within those levels are an additional 25 retro challenge levels that are both annoying and a blast. The retro levels are annoying because if you accidentally run into a gold cartridge in the normal level, you are forced to play it. Normally, when you die, there is very little interruption in gameplay. CommanderVideo zooms back to the beginning of the stage or the checkpoint, the music resets so it’s back on track, and then you’re playing again. It all only takes a couple of seconds. Once you’ve entered a retro level, however, you’ll have three hearts, or three chances, to beat it. Regardless of whether you beat it or not, you are sent back to the level select screen, meaning you’ll have to start the normal level you were playing all over again. This made me regard the retro levels as a fate worse than death when I wasn’t specifically looking for them because they forced me to go through load screens to get back into a level. The enemies you need to kick ticked me off because sometimes, their faces would fly towards the screen so I couldn’t see anything! Although I was worried the game would be repetitive and eventually get stale, it never did. Of the five worlds, only the last one didn’t introduce a new concept to spice up the gameplay, so while the game never drastically changed, there was enough variation to keep the game fun. Once I mastered one move, they’d throw a new one at me. This added to the difficulty of the game, but only temporarily. Once I’d beaten the game on the Just Right difficulty setting, I went back to get Perfects on earlier levels. Only the first two worlds had levels I still needed to get Perfects on, because I was still getting used to the game at that point. I feel the game might have been too easy. In the middle of levels, the path will sometimes split, giving you a choice of taking the easy path or the difficult one. I always defaulted to taking the more difficult path, and I was still able to consistently get Perfects for every level in the last three worlds. After beating the game, it’s really not that hard to go back and get a Perfect on every level. Even playing on Rather Hard difficulty isn’t really that hard. The only difference between the difficulty levels is the number of enemies, thus affecting the highest score achievable in each level. It’s almost like the overall difficulty isn’t really upped at all for the final world. At one point while I was playing in the final world, I actually forgot to lower the difficulty down to Just Right and played through several levels on Rather Hard without even noticing. Some of the background dudes are really creepy, especially in the first world, the Welkin Wonderland! Considering BIT.TRIP Presents… Runner2: Future Legend of Rhythm Alien is clearly a rhythm game, I’d be remiss not to talk about the music. 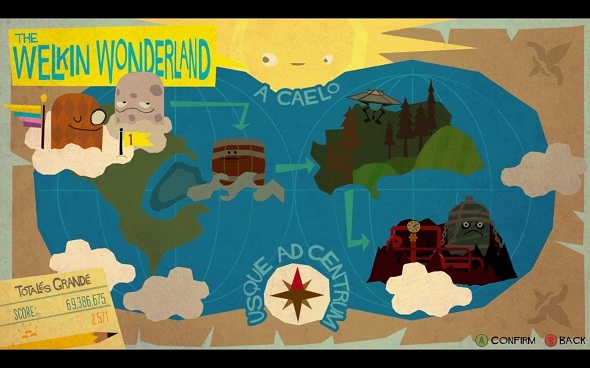 Each world has a base theme that plays. As you go through the levels, you collect gold bars and these floaty red bits. There are four red bit clusters in each level. You start at Hyper, then build to Mega, Super, Ultra and finally Extra with each red bit cluster you collect. Each red cluster adds a layer to the music and another color to CommanderVideo’s running trail. At Extra, he has solid bars of color instead of dots corresponding to music. Every time you collect gold or avoid an enemy, a corresponding note will play, adding to the music of the level. The notes are semi-randomized within a sound type for each action. For example, gold will always make the same kind of sound, but you’ll hear varying notes. You may not hear the same sound if you die and have to collect the same piece of gold twice. Even things like jumping up or down steps will play a sound. The whole thing is really cool, but it’s definitely just a rhythm game and not a music game. Beyond the base tune changing in each world, the music is really the same throughout the game because the sound effects caused by gold and enemies never change. I really wish there had been more substance in the music department. Maybe Gaijin could have drastically changed up the assigned sound effects to create certain moods for certain levels—something sad, something jazzy, something spooky, something nerve-wracking, something dangerous, something frantic, something different for a change! This is probably my biggest complaint with the game. The gameplay didn’t get stale, but the music certainly did. 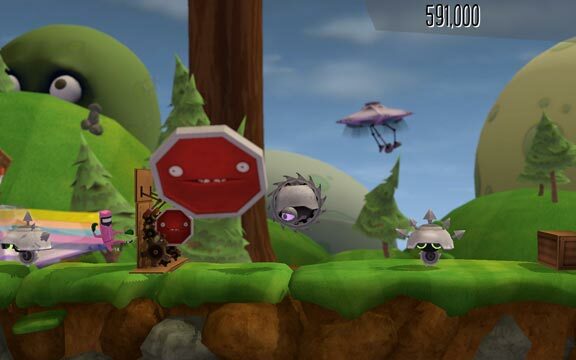 Despite its flaws, BIT.TRIP Presents… Runner2: Future Legend of Rhythm Alien is an addicting and ridiculously fun game. There’s some replay value in playing on higher difficulty levels, but not a whole lot. Even so, it’s a quirky game full of personality and humor, and it’s definitely worth picking up. This review is based on the PS3 version of the game.